A traditional igloo is a domed snow building built as a shelter by the Inuit people in the frozen north. 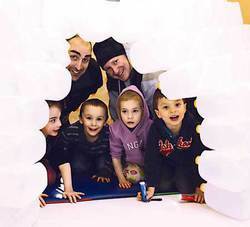 The igloo built in the Wetaskiwin Early Learning and Child Care Centre is built as a play shelter out of 450 – 2 gallon milk jugs secured with 100 glue sticks. The igloo is complete and the children are thrilled. Debbie Pearson, Fund and Communications Coordinator, Boys and Girls Club (who run the Child Care Centre) heard about the project and was about to make the project much less daunting. Debbie contacted Sid Radis, Plant Supervisor of Saputo Dairy Products, Wetaskiwin who connected the Child Care Centre with David Wood the Plant Manager at Edmonton Logoplaste, a company that manufactures several lines of rigid plastic food and beverage containers, including milk jugs. We have shared story time in the igloo. (1-2 adults and 8 – 10 children). The igloo became a haunted house within its first hours of use, filled with hanging bats and spiders (no doubt the remnants of strings of glue adding to the effect) Polar bears have rested in there only to wake up growling! Some of our youngest have even christened it with their tears. The kids have entered wide eyed and excited. “Hey look, I can stand up in here!” one thrilled child exclaimed. “Wow that’s cool” commented one grandparent. From solitary play right through to group experience this has been a welcome additional play space for the child care centre. The Centre, located just east of the Bottle Depot, was opened in September 2009 and has a capacity of 64 child care spaces for children 12 months to 6 years. The Boys and Girls Club operates the facility. The Centre is sectioned into various program rooms that are designed and equipped to meet the needs of each of the age group. This layout ensures all children receive the quality care and attention that parents demand and supports the healthy emotional and physical development of the children. The Child Care Centre is a busy hive of activity from Monday to Friday, 6:45 am to 6:00 pm as children play, learn and grow in a fun, positive environment. The Centre serves families schedules and needs with full-time, part-time and drop-in hours.